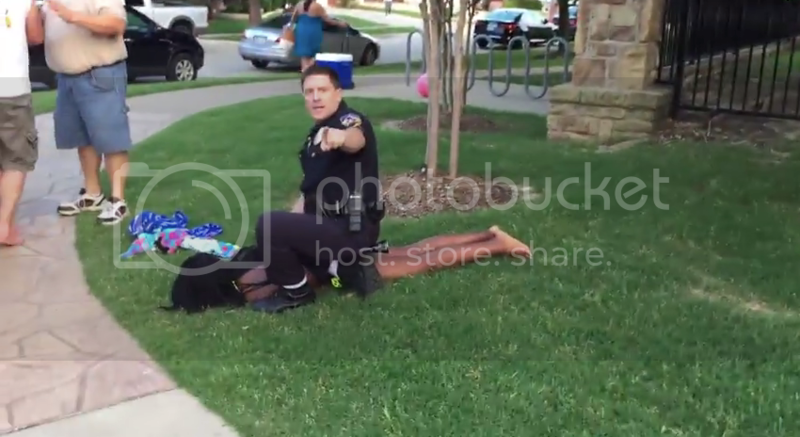 A police officer in McKinney, Texas has been placed on administrative leave after a video surfaced showing one cop pull a gun on a crowd of teens at a pool party. Video that surfaced after the incident shows Officer Eric Casebolt slamming a 15-year-old girl to the ground while she is wearing only a two-piece bathing suit. The girl was later released without charge. Police say they were dispatched to a community pool after a caller said several teenagers were in the area who did not live there or have permission to be there and were refusing to leave. According to the McKinney Police Department Facebook page, multiple officers responded to the scene. The video also shows the same officer drawing his weapon on a group of teens. Police say the officer in the video has since been placed on leave pending the outcome of an investigation. The McKinney PD Chief of Police held a press conference today detailing this weekend's events as well as action they have taken.